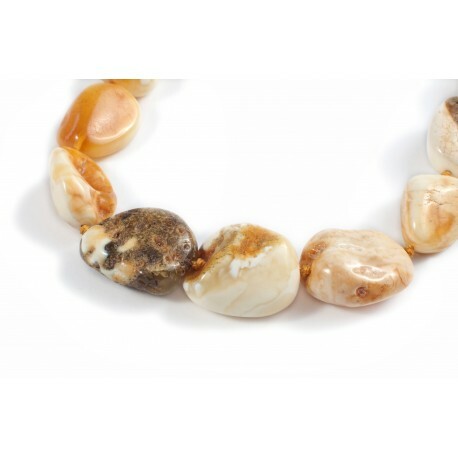 Solid, yellowish, white and black hues' amber beads necklace for a woman who wants to distinguish herself. Yellowish-white hue' beads of amber nuggets. In some pieces soil and plant relics' impurities can be seen. The exceptional beads of natural Baltic amber. White amber - like a hardened foam of the resin which has a lot of microscopical air bubbles. They give a white colour for the amber. White amber is really light and quite rare. Only 5 % of such type amber is found.